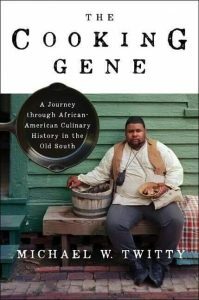 October/November’s Cook the Books selection is My Cooking Gene by Michael S. Twitty. Simona at briciole is hosting. You can read the announcement post here. I applaud Twitty in his journey and his suggestion that perhaps healing our nation may come from understanding the tribulations and terrors that others have experienced along with the merging of food into one shared experience. Since I was short on time (with Thanksgiving and all of that) and I am constantly on the lookout for possible gifts from the kitchen this time of year, I decided to make Twitty’s Kitchen Pepper. It will be in a gift basket of homemade spice mixes for my BiL. Mix together. Store in a cool place. Yield: a little over 1 oz. Try this on pork chops or grilled chicken! Yes, this is a great spice mix. 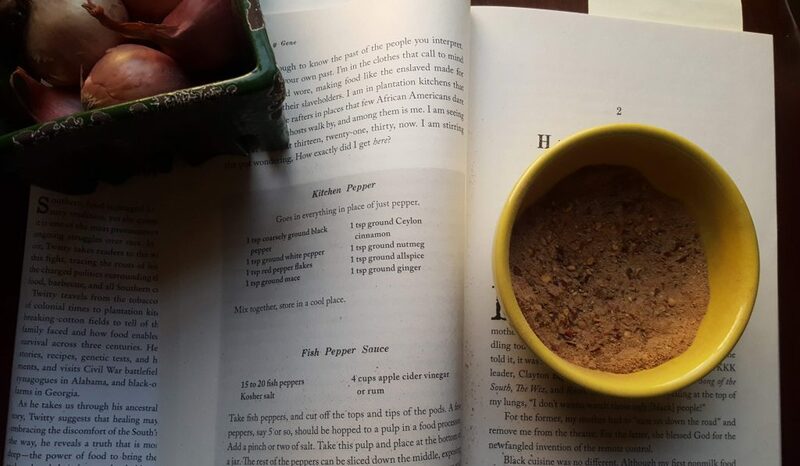 As I savored the grilled pork chop sprinkled with these warming flavors, I also was struck by just how much blood and enslaved toil may have gone into the history of the spices in this recipe. An entire island was conquered and enslaved due to the high value of nutmeg. How many enslaved people died in the delivery of some of these spices? It does make one pause, reflect, and hopefully think. Thanks to Simona for recommending this book. I am linking up with November’s Foodies Read. That sounds like a very interesting and fun read. Can’t wait to try the spice mix recipe! Thanks, Deb. Don’t know that it was a “fun” read, Angie, but it was very provocative. Your friends will be lucky to receive that spice blend! I enjoyed your review of the book. It was a thought provoking read for sure. That spice blend will be appreciated by everyone you give it to! Thanks, Claudia. Really makes one think. Thanks for hosting this round, Simona. 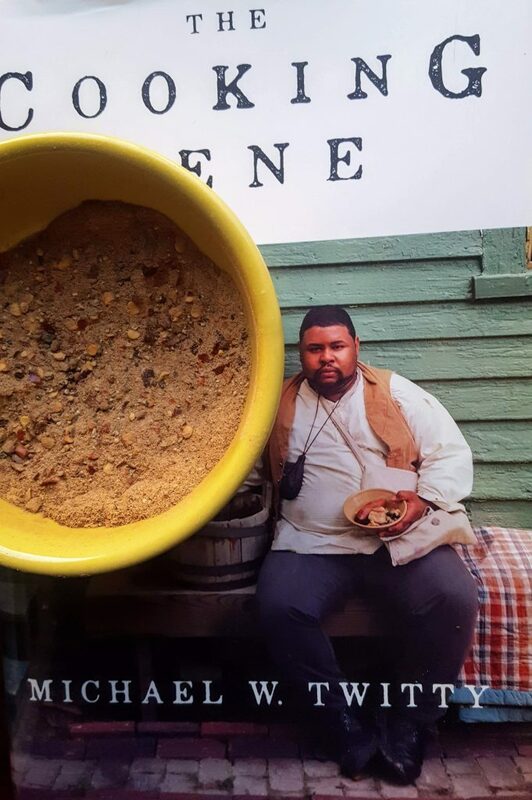 Having grown up in the deep south, I can already relate to this book – cornbread and potlikker. Oh yes, was eating that at a very young age. Have added the book to my cart. Thanks! That spice mix looks interesting. My mom had mace in the spice cabinet but I don’t remember who using it in anything. I need to get some and try this. Looks good. That is so funny you mention mace in your mom’s spice cabinet. That just brought a flashback. I actually had a hard time finding it today and it was $$$. I wanted to be true to Twitty’s recipe so I shelled out the dough. It was worth it. Really not laborious at all (once I tracked down mace). I am only halfway through the book. For some reason, I thought it was November/December. Oh well, I am having a hard time getting through it being such a busy time of year. I understand completely why you made your recipe and I, for one, would love to get this as a Christmas gift. I enjoyed it so I don’t know why I slogged through it. It took me a while too. I really wish he had gone more into his gig at Williamsburg (and he might have done so, I was picking it up and putting it back down so much I may have missed it).